Destination? La Placita, Santurce, Puerto Rico, Market, Don Rey Cigar, Plaza del Mercado, Open Air, Dancing, Drinking, Eating, Local Color, Puerto Rico Year-Round, The Caribbean…There Is A Block Party Going On!! My uncle Guiso, who is in his 8Os said to me…”this is true Puerto Rico, local color at its best”. Uncle Guiso does not go on the computer, let’s hope. 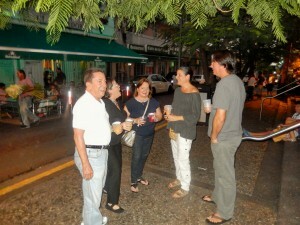 Here is a photo of part of my group as we enjoyed La Placita in Santurce, Puerto Rico, on a Saturday evening. It is Saturday and going to La Placita is something Puerto Ricans do every week. 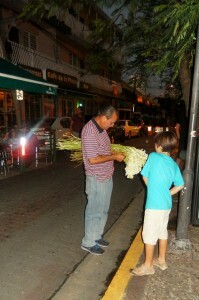 In reality it is the Plaza del Mercado, the true market in every sense of the word. La Plaza del Mercado was established in 1910. 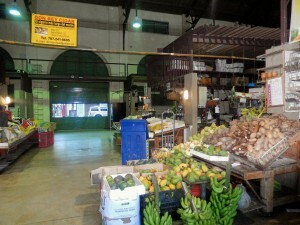 It was a farm that was donated to the Puertorican Government with the condition that they would build this type of market. Many years ago, before supermarkets came into the scene, people went to these markets and got everything they needed. They got to know their vendors up close and personal. 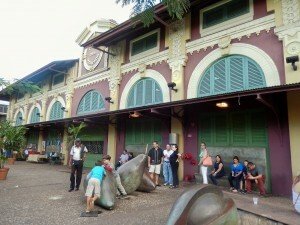 This Plaza del Mercado in Santurce is the only one in Puerto Rico with its own Code of Arms. You can see it on the photo above displayed. It is located at Stop #18 between Ponce de Leon and Baldorioty de Castro. It opens Monday through Saturday from 6 a.m. to 6 p.m. and on Sunday until Noon. Website? 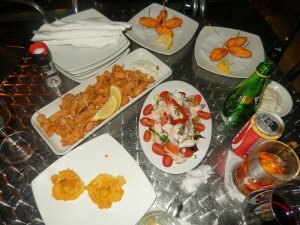 http://www.placitasanturce.com. After 6 p.m. locals gather and the open air block party begins. 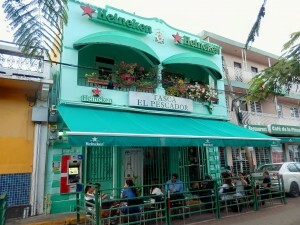 You can buy drinks from the bars around La Placita, like we did. That’s my group waiting for twilight. You can also buy homemade coconut ice cream. The best!! 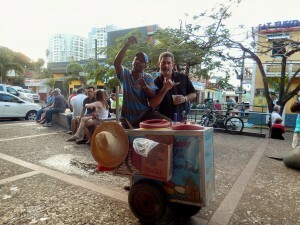 The vendor will be strolling with his cart anouncing “Helao de Coco”. I know that Cuban cigars are sought after, but in Puerto Rico the cigars are also well known. 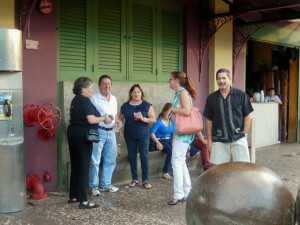 Right at La Placita you will find the home of Don Rey Cigar. Don Rey Cigar has been preserving the tradition and artistry of cigar making. In 2005 they made a cigar that measured 62.5 feet and earned them the award for the longest cigar in the world given by the Guinness World Book of Records and, therefore, breaking Cuba’s record holder. 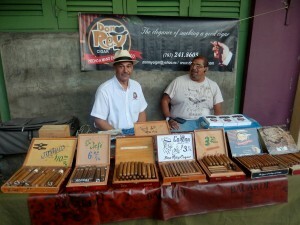 If you want to know more about Don Rey Cigar, please visit http://www.donreycigar.com. 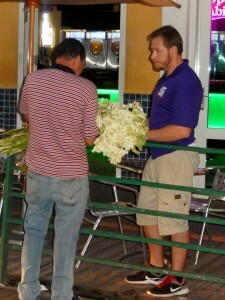 They call him El Azuceno….he sells the most fragrant flowers, and in Puerto Rican homes you can usually find them displayed in vases. El Azuceno was there that evening, but you also can find him in different areas of metropolitan San Juan. 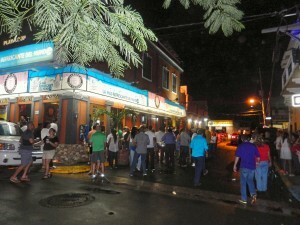 Surrounding La Placita, many restaurants and bars have opened and all of them compete to see which one is the most popular. 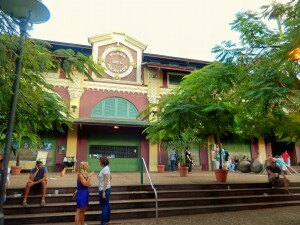 La Placita is a place where many Puerto Ricans come to socialize after work. Puerto Ricans are gregarious and love to party. 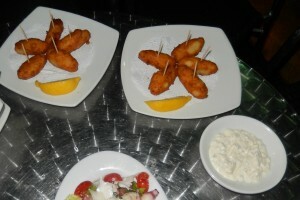 We went to Tasca El Pescador. Usually, know for their good food. On that particular night, it left us very disappointed. The food was okay, but nothing to write home about. It should have been excellent. Everything we order was so local. The service was definitely lacking. Like I was saying….Puerto Ricans love to party and dance….and when it is on the streets, it is even better! Comments Off on Destination? 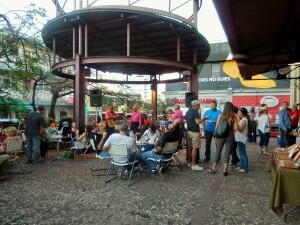 La Placita, Santurce, Puerto Rico, Market, Don Rey Cigar, Plaza del Mercado, Open Air, Dancing, Drinking, Eating, Local Color, Puerto Rico Year-Round, The Caribbean…There Is A Block Party Going On!! Longer days, and hopefully warmer days, as well. Sun kissed skin deserves the best. 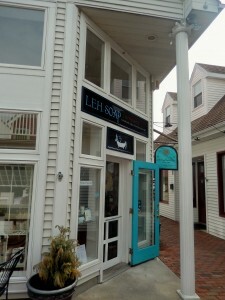 In Rehoboth Beach you will find L.E.H. 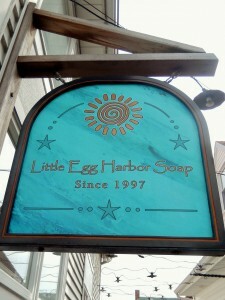 Soap Company (Little Egg Harbor), located at 127C Rehoboth Avenue in the Rehoboth Mews Alley in Downtown Rehoboth Beach, Delaware. Tel. 302-260-9813. Website? 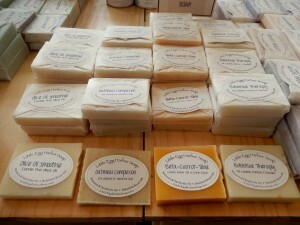 http://www.lehsoap.com. You can find them on Facebook, Twitter, and Pinterest. Shopping, dining, swimming and having fun….all in one square mile. 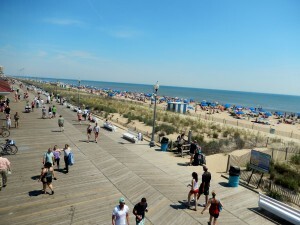 That’s Rehoboth Beach, Delaware. One stop does it all!! That’s why is the perfect vacation destination. L.E.H. 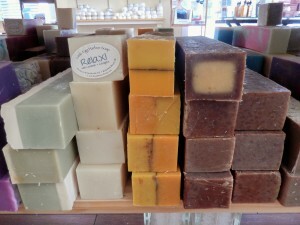 Soap Company has been in Rehoboth Beach for more than a few years. 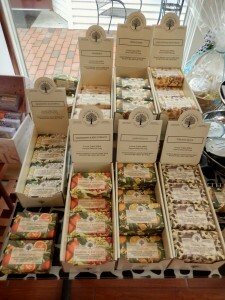 Their headquarters are in Marmora, New Jersey, and that’s where hundreds of small batches of soaps are handmade, hand cut and hand wrapped. 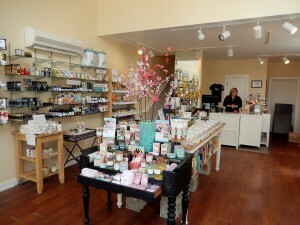 The shop in Rehoboth Beach carries all of their products. 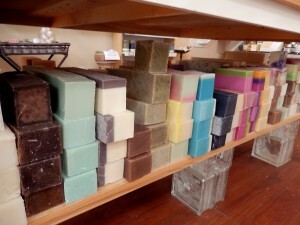 You need to stop by, smell the soaps and sample them by all means. The Store Manager is Cinda Dera. 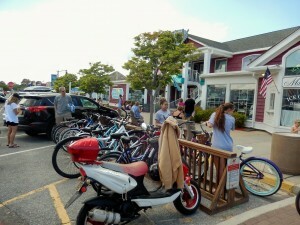 The beauty of shopping at these unique stores in Rehoboth Beach is that the owners and managers are so friendly. Nobody is rushing you….you are the center of attention. Cinda knows everything there is to be known about L.E.H. products. 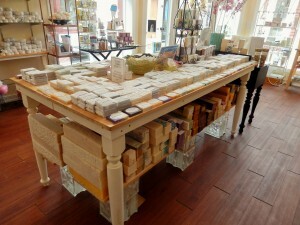 The store appeals to your senses….sight, touch, and smell!! Some shops appeal to a specific gender or age….not here. 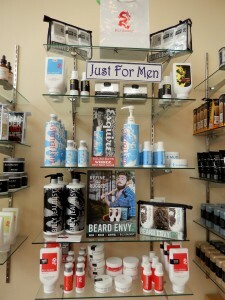 Men, Women, the young and the matured….and even something for your dog, as well. 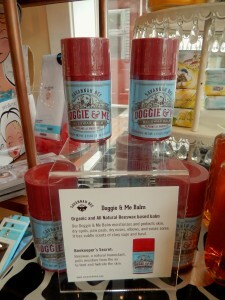 Speaking of dogs….The Doggie & Me Balm products are for skin dry spots, paw pads, dry noses, elbows, and they ease sores, as well. 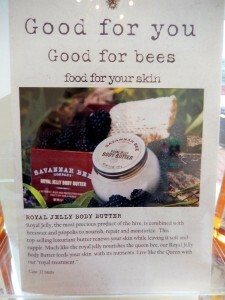 It is an organic and all natural beeswax based balm. Nothing but the best for the pooch in your life. Besides their own L.E.H. 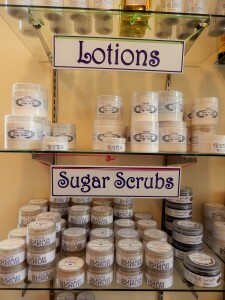 products, they also carry soaps, lotions and scents from the best companies. 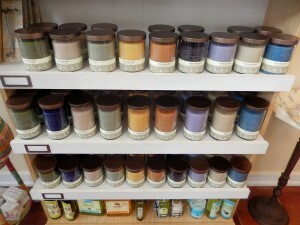 Once again, Cinda can give you a run down on the ingredients and the purpose of each product. Just close your eyes and smell some of the soaps. It is such distinct scent…almost as if you are holding the fruit or flower. If you have not discovered this unique shop, then now you know where to find it. It is the perfect place to find something for someone on your list. 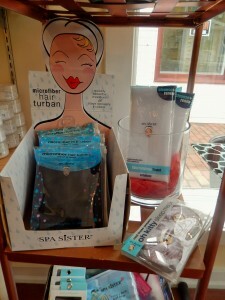 Have guests coming to visit, a little something to make their stay even more enjoyable. 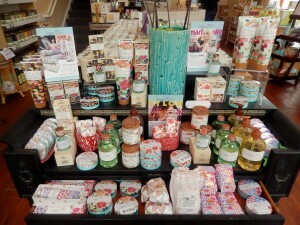 Candles and soaps for housewarming gifts or stuffing goody bags….talk to Cinda at L.E.H. And, what am I giving my friends lately? 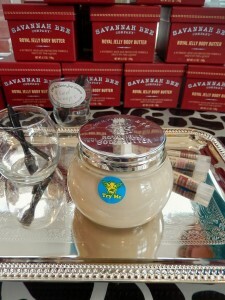 The Royal Jelly Body Butter…. 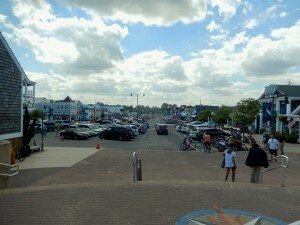 It’s always a good day to shop in Downtown Rehoboth Beach….tax free shopping in Delaware, as usual. Have a great day!! 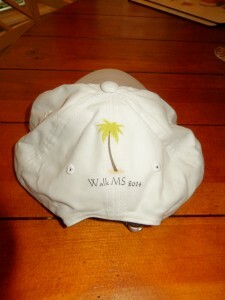 We are Walking for MS and our team is Beach Babes….yes, that’s the name my friend, Jody, gave our team. To tell you the truth I think it is pretty good. We live at the beach and we are walking and coming together with others who are trying to make a statement about their commitment to creating a world free of MS. 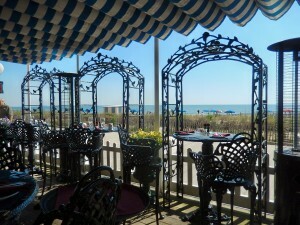 It all started a few months ago, when we attended a Chicks for Charity dinner at Fish On in Lewes, Delaware. This non-profit organization meets once a month and visitors and residents attending have the opportunity to meet one another, have a great dinner, silent auction and raise funds for a local organization. They are on Facebook as Chicks for Charity (Southern Delaware). If you want to know more or to check when the next dinner will be, just visit http://www.chicksforcharity.us. 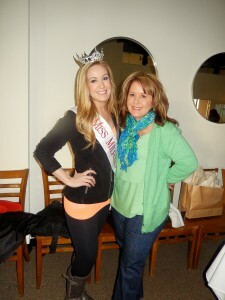 It was on the March dinner that we met Taylor DeMario, Miss Milford. Taylor has a member of ther family who was diagnosed with MS at the age of 20. Needless to say her platform is raising awareness for individuals and families afflicted with MS.
Having seen MS first hand, has made her commitment even stronger. Finding a cure and helping other families deal with this condition is her driving force. Taylor DeMario will be competing for the title of Miss Delaware to be held on Sunday, June 15th at Dover Downs & Casino in Dover, Delaware. We wish her good luck!! Taylor was so well spoken and as I listened to her talk I thought of 2 friends that have MS. For them I am walking. Beach Babes is a small team, but we had to start somewhere. Maybe next year some of the local readers can join us. 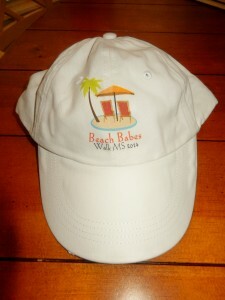 We got those hats made, we got colorful t-shirts and I think the weather is going to be perfect. 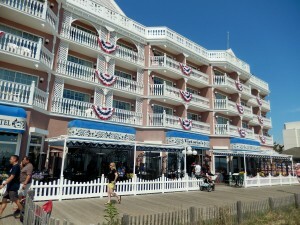 The Delaware Beaches is an excellent area for fundraising….Delaware is a small state but it has a heart of gold. As we Walk MS 2014 we hope to come together with others, to celebrate and to show the “power of our connections”. More info? Please visit http://www.delawarewalk.org. Tel. 302-655-5610. Note: Please meet Jody, my Team Captain, with Taylor. 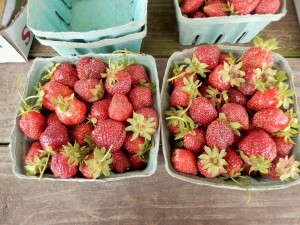 Local Strawberries, Small, Juicy, Sweet….Delicious!! 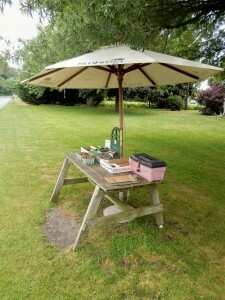 Out & About in Southern Delaware, Local Scenery? Awesome! Love taking the back roads through Sussex County, Delaware…I know, some of you just want to get from point A to point B. I like the scenery Southern Delaware offers. At this time of the year the farms are looking so good. Rural, yes the back roads are definitely that. I was driving on Rt. 17, near Roxanna, and then just a simple stand caught my eye. This short post is just about taking time to enjoy what’s around you. Throughout Sussex County this is a typical scene. Small growers put their produce out in the hope that someone like me will stop. Of course I did! It is also an honor system. Pay for what you get. It is as simple as that. The local strawberries are small. They are also juicy and sweet. This year, strawberry season is a bit delayed. But, the berries coming out are pretty good. 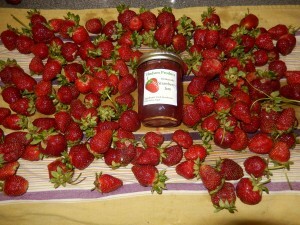 The strawberry jam? I have not tried it yet. Can’t wait. 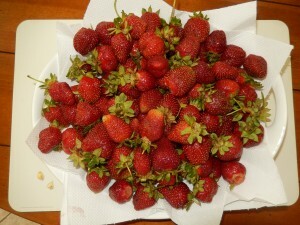 Gorgeous strawberries!! 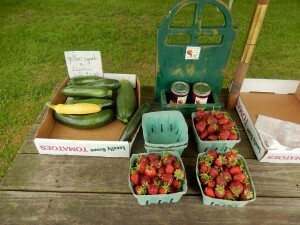 Buy from local farmers!! By the time you read this post the strawberries will be gone. They are so good for you….I don’t feel guilty eating them all. 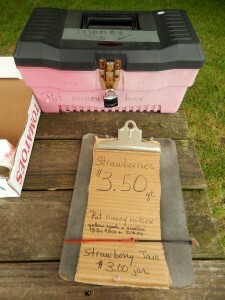 Comments Off on Local Strawberries, Small, Juicy, Sweet….Delicious!! Out & About in Southern Delaware, Local Scenery? Awesome! It was built in 1873. Through the years, it has changed. But, one thing that never does change is the fact that from the beginning it was a place to embrace the seacoast and a “mecca” for summer leisure fun acitivites. 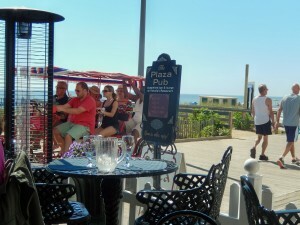 It is right in Downtown Rehoboth Beach, with the background…the Atlantic Ocean. 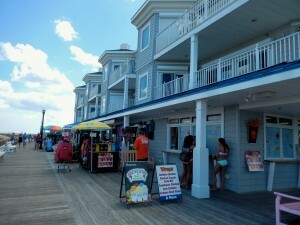 Plenty to eat at the Boardwalk. 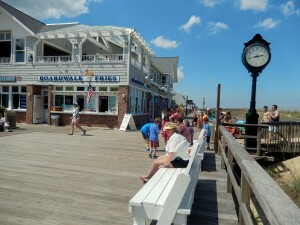 You never forget the aroma of French fries, and all that Boardwalk grub. 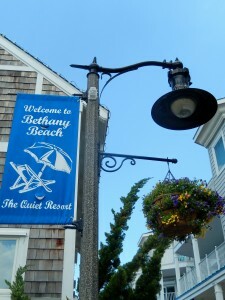 The benches are iconic and were donated by the Village Improvement Association of Rehoboth Beach. The perfect place for people watching. It was gorgeous this Memorial Week-End. One of the few when the weather participated every single day. 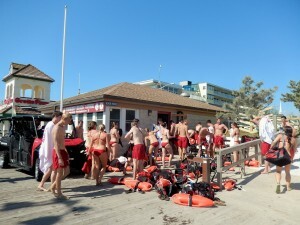 You never know who you are going to meet on the Boardwalk. 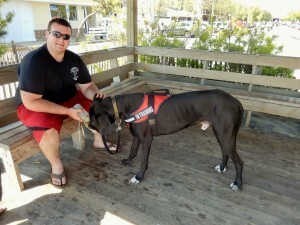 Casual chatting….Jody and I met Titan’s handler. 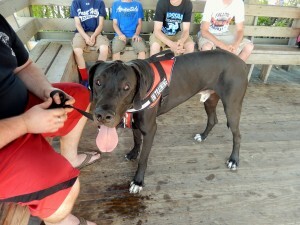 Titan was only 16 months old and in training to become a therapy dog at hospitals with patients with anxieties….Loved it!! 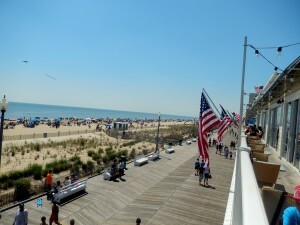 It does not matter if you look north or south on the Boardwalk…..the views are priceless! NOTE: Need Beach Wheels? They are available from 9 a.m. until 5 p.m. through Labor Day. 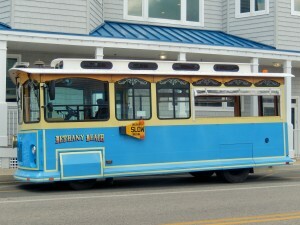 They are located at Maryland Ave. and The Boardwalk and Laurel Street & The Boardwalk. They are right on the beach. 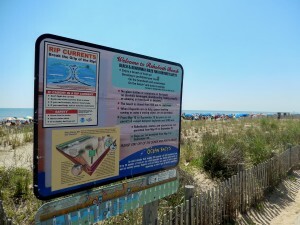 Please remember that they cannot be removed from the beach. No rental fee; first come first serve basis. Finally, a gorgeous week-end. So, looking for a place to have breakfast on Memorial Week-End was going to be tough. I don’t like waiting in line. Jody and I found the perfect place….we wanted to sit outside. 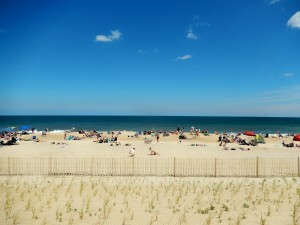 After the winter weather, when it is sunny and hot at the Delaware Beaches, that’s what you want to do. We found it!! 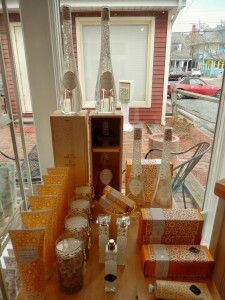 Victoria’s Reaurant is located inside the Boardwalk Plaza at 2 Olive Avenue & The Boardwalk in Downtown Rehoboth Beach. The key word here is Boardwalk. Tel. 302-227-7169. Website? 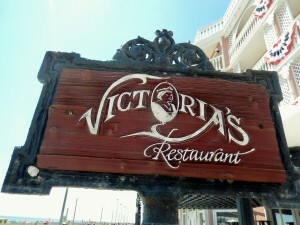 http://www.boardwalkplaza.com/victorias-restaurant. 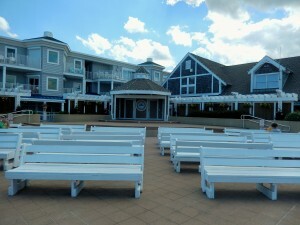 At Boardwalk is where you want to sit…forget the inside. 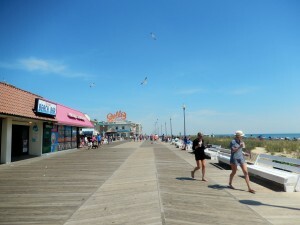 Jody and I walked the beautiful Rehoboth Beach Boardwalk, passing the lifeguards who had finished their morning exercises. Our service was prompt. 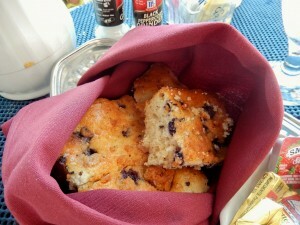 Love it when warm blueberry sweet breads were presented with our coffee. 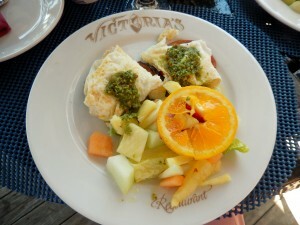 My Grilled Portobello Benedict which grilled protobello caps were topped with scrambled egg white and Canadian bacon, drizzled with pesto sauce and served with a side order of fruit salad, really was perfect. Jody’s Spinach Mushroom and Quinoa Frittata also was delicious….and healthy. 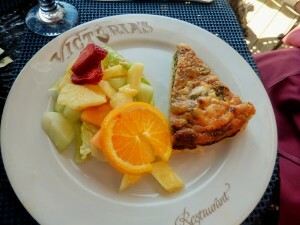 It was made with fresh spinach, quinoa, chopped portobello mushrooms, parmesan and ricotta, served with seasonal fruits. 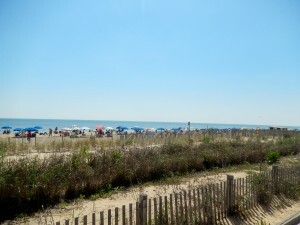 When you are at the beach, you want to enjoy the outdoors and on a beautiful day…..it was priceless!! What a beautiful day! 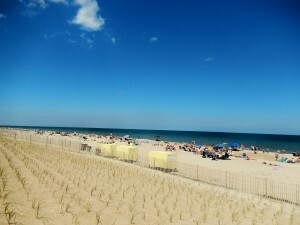 This week-end pretty much starts the summer season at the Delaware Beaches. These coastal towns are ready….I have seen them fixing streets, painting and sprucing up. 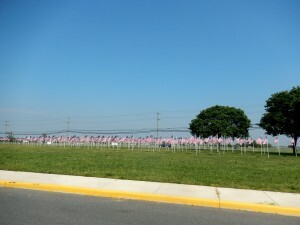 Last year Flags for Heroes got underway….all of a sudden visitors and residents were surprised to see the grounds of Cape Henlopen High School full of American Flags! 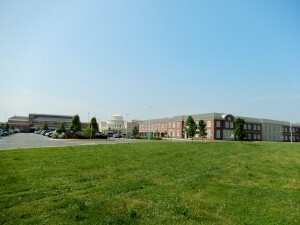 Cape Henlopen High School is located at 1250 Kings Highway in Lewes, Delaware. It was so impressive and it overcame all of us with patriotism. 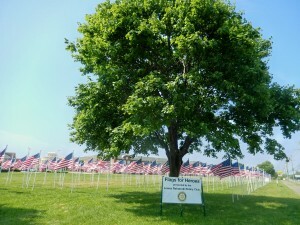 I believe last year they had a goal of 300 flags. 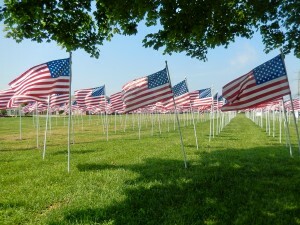 This year’s event had a goal of 500 flags. It looks like they have met the goal. You have to drive by it. It is so neat. 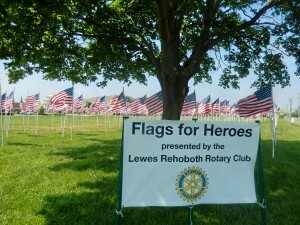 The sponsorships were sold by the Lewes-Rehoboth Rotary Club for $50 and would honor veterans and men and women currently serving in the military, as well as first responders and personal heroes. Last year’s proceeds funded 2 scholarships to veterans in Delaware Tech’s Wounded Warriors Program and helped purchase a new ambulance for the Lewes Fire Dept. Proceeds from this year’s sponsorship will continue to support first responders and military organizations, as well as scholarships to students participating in ROTC programs in college. 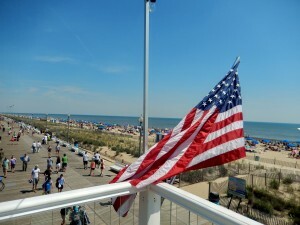 The Lewes-Rehoboth Rotary Club has a Facebook page. You can also get to know them better by visiting http://www.lewes-rehobothrotary.org. NOTE: Deadline for purchasing a sponsorship is today, Friday, May 23rd. Call 302-645-5896.